Painting or staining your deck not only gives it a face lift, but also protects it from the elements. These coatings deteriorate over time and require stripping and repainting regularly. 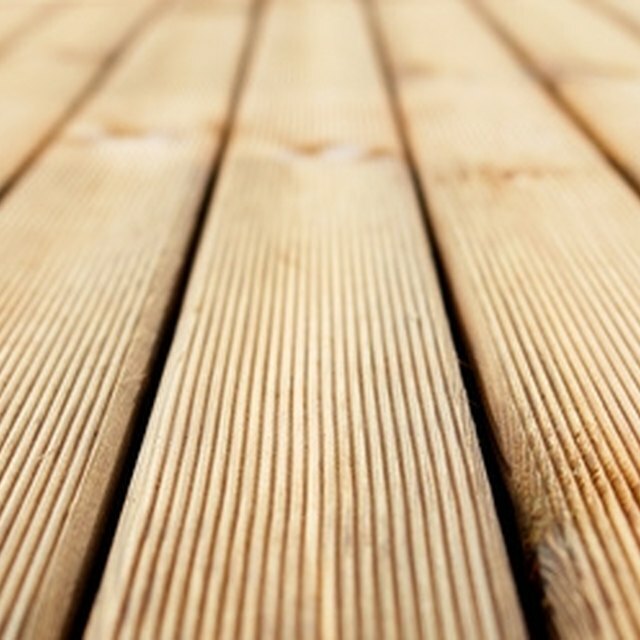 The process is intimidating and time-consuming, but most homeowners can strip and refinish a deck without hiring someone else to do the job. Regular stripping and repainting of your deck prevents mildew and sun damage. Apply paint stripper using a paintbrush or a roller and let it sit for about 10 minutes. It is important to keep the deck wet as you work, so apply stripper in small areas so that you can scrub while the deck is still wet. Scrub the treated area with a nylon-bristled brush to remove loosened paint. For thick areas of paint, use a scraper to gently lift the paint from the wood. Rinse the cleaned area with water. Repeat application of the stripper and brushing until all painted areas have been cleaned of paint. Sand raised areas of wood lightly with a fine-grit sandpaper. Leave the wood to dry before painting, which may take up to 24 hours. Cover the floor of the deck with a drop cloth or plastic sheeting to protect it from drips. Apply paint to the inside areas of rails and spindles beginning at the corners and working from the top to the bottom, using a 2- to 2 1/2-inch paintbrush. To avoid drips, tap excess paint or stain on the side of the bucket before each application. Only paint the portion that you can easily reach. Reload your brush with paint about every 4 go 6 inches to keep a wet edge. Paint only two to three spindles at a time, applying paint to the top and bottom rail of each section as you go. Continue painting in small sections until all supports, rails and spindles are covered. Move to the outside of the deck and repeat the process with the opposite side of the rails, frame and spindles. Remove the drop cloth from the floor after the rails and spindles have dried. Cut in a 2- to 3-inch-wide strip around the edges of the deck floor with your paintbrush. Begin at a corner and follow the grain of the wood as you paint. Roll paint onto the surface of the deck floor using a paint tray and roller in 4-foot sections. Brush back each 4-foot section using your paintbrush after the paint is rolled on. Continue painting the next 4-foot section and brush back again. Repeat rolling and brushing back until the floor is covered entirely. Allow paint or stain to dry for at least 24 hours. Some paints may require an additional coating.